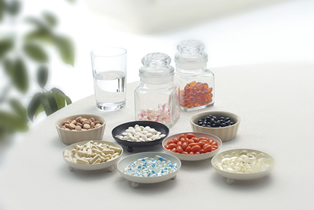 ﻿ Dietary Supplement OEM (Contract Manufacturing) Total Planning｜API Co., Ltd.
Total PlanningTotal planning from proposals to sales strategy and support. How do we satisfy our customers? 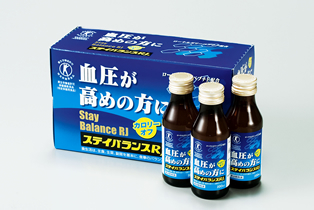 Twenty years ago API was founded as one of the first dietary supplement OEMs. Through trial and error we have faced and overcome a multitude of issues. 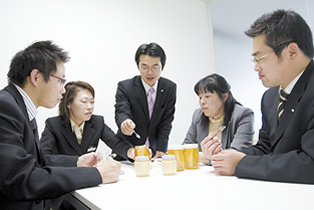 Our know-how is based both on theory and actual sales-oriented practice, and this has generated a significant impact. After meeting with our customers, we engage in total planning that encompasses everything from product concepts to materials, designs, flavors, packaging and advertising. The know-how we have accumulated as a dietary supplement professional, coupled with our outstanding data collection skills, allows us to maintain a position from which we can respond to the needs of the times and propose even more effective plans. We constantly collect and analyze the latest information on what customers demand and what kind of products are selling well, and we use this in our plans. Our expert marketing staff do not merely collect data, they decipher how to leverage it for commercializing products. The Sales Division, Product Development Division, Production Division and Quality Assurance Division all work together to develop products. All employees work with customer benefit in mind. This is why we succeed at quickly creating the products that customers demand. We pinpoint target markets in light of contemporary needs and issue proposals that are appealing to end users. 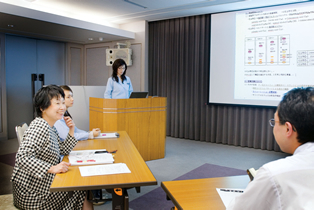 We provide easy-to-understand materials on product content as well as sales promotion plans. We strive to work with customers to create the products that people desire.